M'Benga takes his name from the semi recurring character in Star Trek. 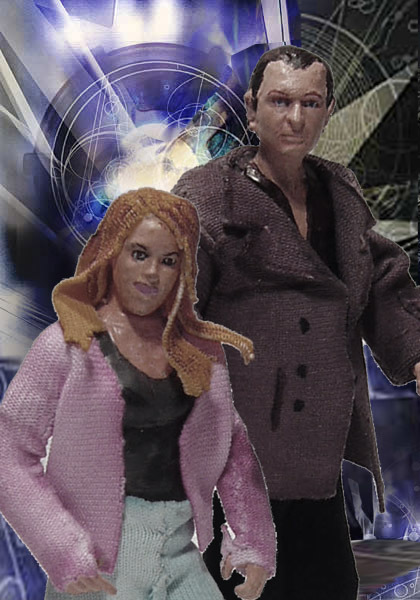 Given that the new series would be dynamic and a departure from what had gone before, I wanted the figures of Rose and the Doctor to reflect that with cloth clothes and increased articulation. This time I wouldn't use the same molds I'd used for all the other Doctors but modify existing figures. For the Doctor I selected the "vintage" original trilogy Han Solo figure mainly because of it's greater articulation but also because it most closely resembled Christopher Eccleston. It was a simple job to trim off the Han Solo trademark belt and his hair. 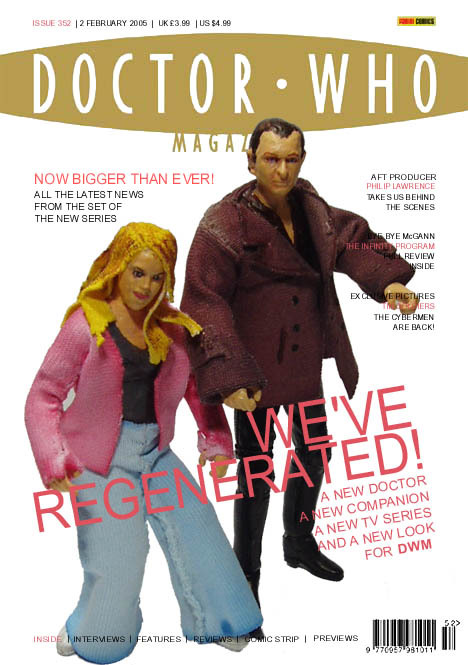 His nose, ears and the Eccleston hair cut were added using Plasto- a kind of plastic cement. His jacket is made of cloth that's been painted and is removable. Most of the pictures of his jacket make it look a kind of distressed brown though on the TV it looks more like black. His trousers are cloth and his T shirt is burgandy based on his appearance in "Rose". Since Rose is going to see as much action as the Doctor I wanted a suitably articulated figure for her. The best I could find was the Attack of the Clones Padme (Droid Factory). The only drawback with this figure is the face- in it's permanent scream mode. I had considered switching heads with the Episode 1 Padme but the neck on this figure was too wide for an easy switch. So instead I used Sculpy to take a cast of the lower part of her face, filled it with Plasto and applied it to the Rose figure. The result is a Rose with a closed mouth but I wasn't entirely happy with the likeness and planned to change it further down the line. The next problem I had with Rose was her hair. To give her solid hair made of Sclupy would limit her head articulation and I didn't want that so I experimented with making Sculpy 'wigs' that could be switched according to what her hair was doing- either down, or windswept as she runs or even in a period style. This proved impractical however as Sculpy is quite brittle and didn't stand up to being removed. So I hit upon the idea of cloth hair. Once she appeared with her hair up (The Long Game) I altered it. Rose's clothes are loosely based on her first appearance in Rose with cloth jeans and a pink sweater that can be removed in anticipation of her wearing other clothes in other stories. I initially painted her T shirt in red but it was far too vivid so I changed it to grey. 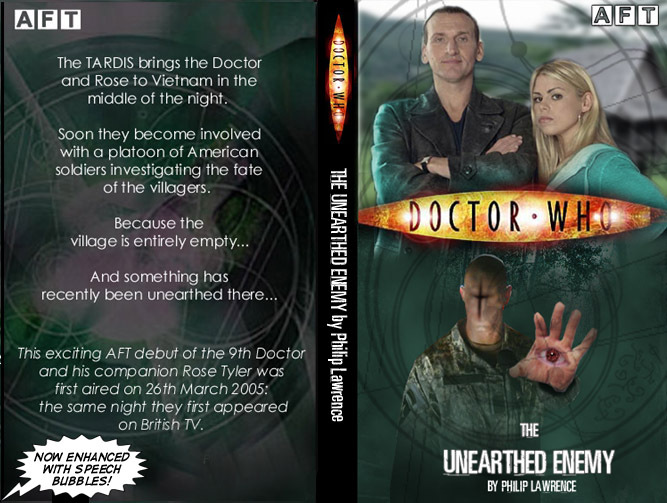 The story was originally posted on 26th March 2005, the very same day that the new series debuted on BBC1. It was after this episode that the AFT took it's first official hiatus, with no new stories appearing until November. There are several reasons for this including the pressure of preparing new episodes on a monthly basis. The main reason though was a lack of inspiration and the fact that the new series had initially been something of a disappointment. The book cover was based on the new style novel covers. 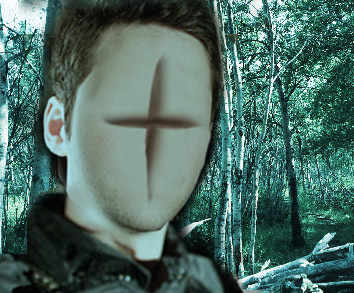 The main image was updated for October 2006, the original appeared like this. 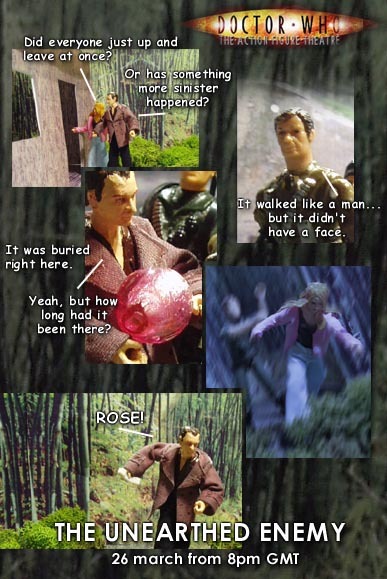 This story was originally supposed to be the first of a series of six one episode adventures for the 9th Doctor and Rose, some of which (Tin Soldiers/ Backwards) have since seen the light of day. At the time our only real reference for the new series style was a leaked copy of The Empty Child/ The Doctor Dances. An early viewing of Rose also allowed some tweaks in the story ahead of it's transmission. The Inner Circle are at the island drinking the last of their potion. There are three of them dressed in robes, humans with eyes tattooed on their left hands. They drink. They transform, the eyes on their hands becoming real eyes. A storm. The TARDIS lands on the island and as the Doctor and Rose explore they hear a crash from above. A WWII plane crashes in the trees above them. A book drops down from the plane which Rose and the Doctor retrieve. They now see the Nazi emblem on the plane and hear a rescue party so they decide to depart. But the crash has caused a tree to fall in front of the TARDIS. The Doctor becomes fascinated by the book which on first glance speaks of ascension to a higher race. Karl is rescued and faces the Inner Circle. They tell him that they have ascended. He is angry but they warn him that he is but their servant. The Doctor joins the initiates and meets Karl, Max’s protégé. He discovers that they are digging deep underground for an artefact. When the Doctor is discovered, Max covers for him. Later when they speak, Max reveals that he is working undercover and is eager to uncover the mysterious Brotherhood. Rose is captured because she has the book. She will learn a lot from Karl before she is taken to the Inner Circle. She initially escapes and hides. When one of the brothers comes looking she cuts off his hand rendering the creature blind. The artefact is found and Rose is to be the first to ascend. Karl protests that he should be first. But now the Brotherhood reveal that his genes are not compatible. His kind will be destroyed under the new order. They try to get Rose to drink but the Doctor destroys the vial with a well aimed cricket ball (or something). The book has revealed how the Order can be destroyed and the two remaining brothers are dispatched. But the Order will go on. Max is a perfect candidate and has already been exposed to the gene pool. He transforms and takes the artefact to be released across London or Europe. The Doctor jumps into a plane and follows, taking out Max’s plane and then diving to collect the gene pool. When the series was being written, AFT readers were asked to vote on what monster they wanted to see do battle with the Doctor and Rose. Ultimately the Cybermen won out (Tin Soldiers) but for a long time it looked like the winners would be the Zygons. The original premise of the story was set during World War 2 on a remote and rain swept island where Nazi occultists were searching for a lost artefact- in fact a Zygon spaceship. When the Zygons lost the poll, the story was changed. The artefact became the Gene Pool and the Zygons became the Vorshak (later the Igaard). Since it was deemed easier to create a group of America GIs than a group of German WW2 soldiers, the setting was switched to Vietnam. The design of the Vorshak was retained into the final draft of The Unearthed Enemy. Working titles for the story included The Inner Circle, The Brotherhood of Death, The Order of the Teutons. The finished story was called The Empty Village but it was decided this was too similar to The Empty Child. The words "Bad Wolf" to the side of the chopper in order to fit the series one ongoing theme. 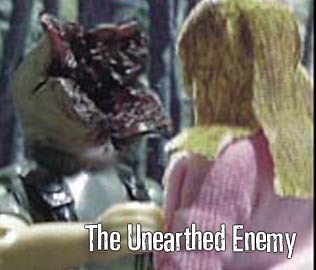 At the time The Unearthed Enemy was written, very little was known about the new series, it's ongoing back story and even the relationship between the Doctor and Rose. As such, there are no continuity references in the story. The Doctor uses his psychic paper (first seen in The End of the World). Pre-empting the series' use of modern technology, the Doctor has a mobile phone and has Rose on speed-dial. The side of the chopper bears the words 'Bad Wolf' a recurring theme throughout series one. It is assumed that this story takes place early in series one and is placed between The Unquiet Dead and Aliens of London.